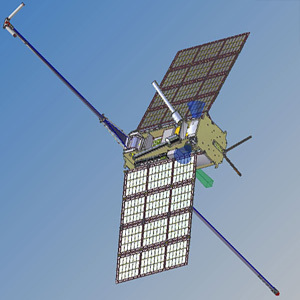 Chibis-M is a 40 kg microsatellite built by the Space Research Institute (IKI). The satellite conducted ionospheric research. It was launched piggy-back on the Progress-M 13M cargo craft and was deployed from the craft after the Progress left the ISS. Chibis-M carried a plasma-wave experiment, which was aimed at the solution of a fundamental problem – a study of the interrelation of the plasma-wave processes connected with the manifestation in the ionosphere of solar–magnetosphere–ionosphere–atmosphere connections and the parameters of space weather. The specific fundamental problem is the search for universal laws governing transformation and dissipation of plasma-wave energy in the magnetosphere-ionosphere system. After 2 years and months on orbit, Chibis-M reentered still operational on 16 October 2014.